Earthworks is Meldrum Fresh Market is a member of the Detroit Community Markets. If you are not able to support our market we suggest supporting your neighborhood market. 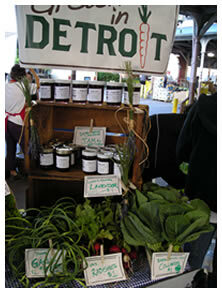 We support "Grown in Detroit" markets, a program of the Keep Growing Detroit, at farmers markets throughout Detroit. "Grown in Detroit" is produce that has been grown in family gardens, community gardens and urban farms in Detroit, Highland Park and Hamtramck. Please see the Garden Resource Program Collaborative calendar to learn where and when you can purchase or eat Grown in Detroit produce!